Craniosacral & Integrative Manual therapy is a gentle non-invasive hands-on approach to assessment and treatment that release tensions deep in the body to relieve pain and dysfunction and improve total body health and performance. Also called CST or cranial osteopathy, it was developed by an American osteopathic physician almost 100 years ago. The craniosacral rhythm of approximately 6 to 12 cycles per minute is understood as a response to the formation and re-absorption of the cerebrospinal fluid and the fluctuations within the spinal cord and brain environ. The subtle movement extends out through the entire body in response to the fluid pressure changes around the central nervous system. A craniosacral & Integrative Manual therapist is able to detect disturbances in the craniosacral rhythm and thus identify areas of dysfunction and help to correct them by working on the cranial, sutural membranes and other soft tissue restrictions in the body. Integrative manual therapy (IMT) is an approach to diagnostic and treatment methods that assess and treat pain, dysfunction, and disability of the whole body using gentle hands-on techniques to promote tissue repair, normalise structure and restore function. IMT was developed by Dr Sharon (Weiselfish) Giammatteo over the past 30 years. IMT enables practitioners to identify and address the underlying causes of dysfunction using a comprehensive approach. This approach integrates all the systems of the body, including musculo-skeletal, nervous, visceral, lymphatic, circulatory and craniosacral. It has been discerned that each system has its own inherent rhythm. Treatment of restriction or dysfunction in any or all of these systems is considered after diagnosis and disturbances have been found. Working with naturopaths in order to integrate nutritional programs is also considered. 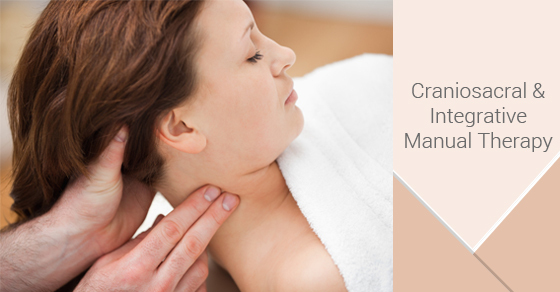 If you are interested in Craniosacral & Integrative Manual Therapy, give us a call at PhysioNow.